From improper dieting to environmental components such as stress, both internal and external factors can influence our aspect. Hair and nails aspect is important for a woman’s look. When brittle and damaged, both hair and nails become reason of social embarrassment and in some cases they can raise concerns on the general health state. To avoid triggering of these conditions, Nuviante offers a natural combination of active ingredients that can boost hair vitality and appearance, in a healthy and natural way. By stimulating growing of new hair follicles, Nuviante promotes a safe and all-natural solution for one of the most common problems of both men and women after 30 years of age: hair loss. This product’s essential ingredients are carefully chosen to empower hair volume and strength and to repair existing damage from the roots to the top. Ingredients: biotin, pantothenic acid, horsetail and para-aminobenzoic acid. But let’s see what each ingredient in Nuviante can do for your hair’s health. Biotin – helps synthesizing healthy fatty acids that contribute to cells growth and accelerate repair processes. For improvements that are visible, for both hair and nails. Pantothenic Acid (vitamin B5) – fuels cells for stronger hair follicles and a faster growing rate. This ingredient also keep the dandruff away and promotes a healthier scalp. Horsetail – contains silica and selenium. Both elements will make your hair and nails regenerate faster and will improve their aspect and texture. Para-Aminobenzoic Acid (PABA) – fights against free radicals damaging effects. Because a woman’s hair aspect boosts her confidence and improves the quality of her every-day life, Nuviante is the natural supplement that besides working wonders on your hair, also empowers you to feel happier. Hair loss and graying are another two important common hair-related problems, that Nuviante successfully addresses. 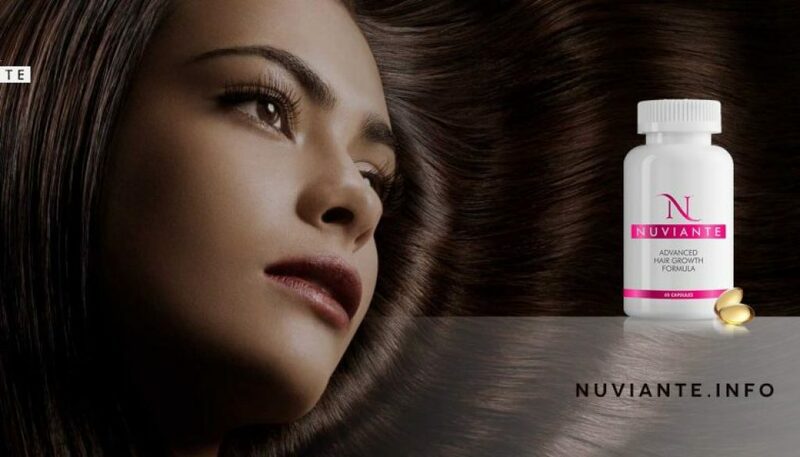 For a nourished and stronger hair, with a sheen, healthy aspect, regularly use Nuviante as indicated by the manufacturer.